That makes 3 firsts in a few minutes! First! It must be really bad to paint the whole fence! You were quick tonight Sera. The rest of us were snoozin’ cause we’re loosin’ and if the drivers don’t slow down their cruisin for a bruisin. Must be going pretty fast out there. Put some bumps in the road for them Matt and see if they slow down. It’s got to be bad for someone to write this out so big and long on their fencing. 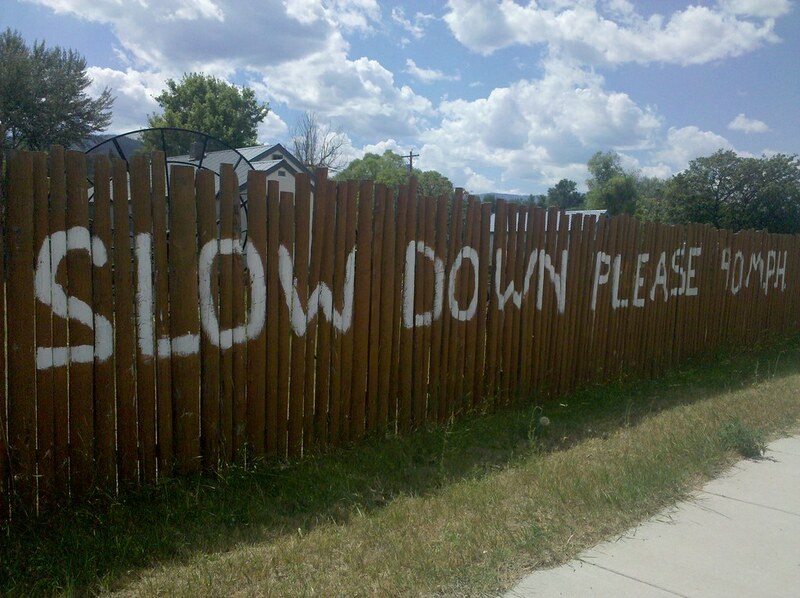 Slow down people! What do you think it is the autobahn? Big sign, Big satellite dish, Big Sky!! Is that 40 or 90 on the end? it’s one of the reasons i love this blog so much. he doesn’t HAVE to arrive at a set time and is certainly in no hurry. while life is rushing by, i’m glad matt is there to stop and smell the roses (and share his stories) for us. There is a lot of open sky, open road, long distances between destinations and not many people in Montana. 80-90 miles an hour is not unusual, especially in the eastern part of the state. How many days has Matt been walking in Montana? He reached Montana on Day 100 so he’s been walking across the state for 25 days now and about to cross into Idaho. Wow Matt! Walking across Montana in just about a month’s time. Awesome! Take into account at least 1 rest day in Great Falls and that he’s farther sometimes than the pics posted here and it may be a few more than 25. Either way, it’s been about a month for each state so far. 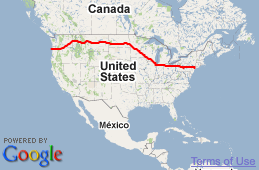 But Idaho won’t be that long as it is a shorter distance. Idaho panhandle is only about 60 miles (as the crow flies) East to West. After a month crossing Montana, Mattwill be through Idaho LICKETY SPLIT! Idaho North to South…. now THERE”S an LONG WALK! You’ll have to put a 0 at the end of matt’s actual mPh or he will get a ticket for going to sllllooooow. He’s coming up on Fairchild AFB in Spokane. I’ll have my son-in-law hook Matt’s cart up with some rockets so he doesn’t hold up traffic. I need this sign for my street!! The biggest problem with drivers here is that they drive the same speed whether it be on the freeway or my street. The only time I want to drive fast is when I get on the freeway (SoCal has spoiled me in this way…where you can pretty much go 70-80 on the freeways!) but on my street, it’s 35 buddy! No more! There are kids and bike riders and walkers and DEER out here!! Oy. Paint a sign of your own and stick it up in your yard if you’re allowed. Get some attention that way like these people did. A first for me. How about slow down and smell the roses. Now tht would be original, wouldn’t it. Honey when we wrecked the car I got a rose bush of thornes in my you know what. OK just because I was speeding and wrecked does not make me a prick!